Briefly describe 7 types of breast cancer and breast cancer staging. Discuss the psychological, psychosocial, and cognitive effects of breast cancer. Describe six surgical options for breast cancer. Describe how 6 anatomical structures are affected by breast cancer surgery. Discuss the general process and three phases for breast cancer surgery rehabilitation. Discuss professional responsibilities when working with breast cancer clients including general guidelines, questions to ask your clients, and 6 recommended general assessments. Describe the Pilates principles, Pilates equipment, and 8 Pilates pearls. 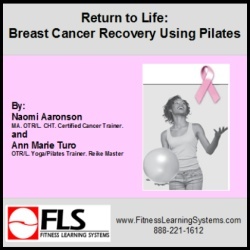 Identify 17 benefits of Pilates and 9 things to be mindful of when working with breast cancer survivors. Describe the anatomy of Pilates including 5 anatomical structures. Identify 4 Pilates principles important to practical application of exercises. Explain how to safely and effectively perform 6 Pilates exercises for Phase 1 recovery. Explain how to safely and effectively perform 7 Pilates exercises for Phase 2 recovery. Explain how to safely and effectively perform 8 Pilates exercises for Phase 3 recovery with progression. Identify 3 options for breast symmetry after a mastectomy.